Showbiz ▸ Sandara Park as judge of new ABS-CBN show, goodbye 2NE1? | Sandara Park as judge of new ABS-CBN show, goodbye 2NE1? | Sandara Park as judge of new ABS-CBN show, goodbye 2NE1? Sandara Park as judge of new ABS-CBN show, goodbye 2NE1? Social media posts by key ABS-CBN and Star Cinema Adprom people confirm that Sandara Park will be one of the judges of ABS-CBN's new show, 'Pinoy Boyband Superstar'. ABS-CBN Adprom manager Mico Del Rosario posted a short video of Sandara Park on Instagram. The Korean star, lovingly called 'krung-krung' by her Filipino fans had this message for her fans, "This is going to be exciting. See you Kapamilya, mahal ko kayo!" According to Star Cinema's Adprom director Roxy Liquigan, Sandara will be a member of the panel of judges of the new reality show. 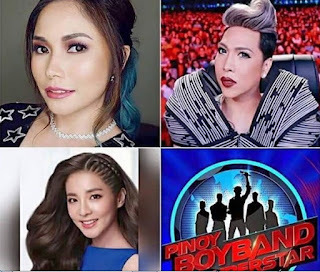 Vice Ganda and Yeng Constantino will also act as judges of 'Pinoy Boyband Superstar'. Meanwhile, Yeng also posted on Instagram a teaser poster for the new show. She said she finds it "Super exciting!" to be part of the new show and to work with Vice and Sandara. Netizens are very receptive about the upcoming reality show. But some expressed their sadness because it may mean that Sandara's girl band, 2NE1, will never have a chance for a comeback. 2NE1 is in trouble lately as Minzy left the group, CL is going solo and Bom is not really active or in hiatus. Now that Sandara is going to have a regular show in the Philippines, does it finally mean goodbye to 2NE1? Home » Showbiz » Sandara Park as judge of new ABS-CBN show, goodbye 2NE1?